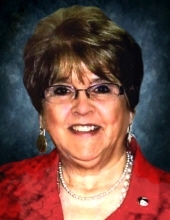 Gloria A. Marden, 70, of Saginaw, formerly of Reese, died early Saturday morning, October 20, 2018 at Covenant HealthCare, Cooper Campus in Saginaw. She was born April 20, 1948 in Saginaw, daughter of the late Roy and Evelyn (Gilmore) Wascher. She attended Reese Public Schools and in her younger years attended Christ Lutheran Church in Reese. Gloria was married to James Billette. He predeceased her. She was self-employed as a home care health aid most of her life. Her hobbies included crocheting, sewing, and gardening, but being “grandmother and great grandmother” to her grandchildren was the top priority in her life. Her grandchildren all called her Rose, f r o m the Golden Girls, because she was always silly. She would do almost anything to get the kids laughing, including doing the “Stanky Leg”, as one of her many dance moves. Gloria was known for her super sense of humor. She would surprise everyone with her ability to use her quick wit. She made sure that everyone she loved knew they were special. Her warming personality made everyone feel safe in her presence. Surviving are her four children; Deborah Arden of Saginaw; Patricia Dost of Bay City; Joanne Marden of Saginaw; and David Marden and his wife Adrianna of Midland; twelve grandchildren; Tiffany (Robert II), Crystal Whyte, Tricia Dost (Isaac Henkel), Derek Dost, Cody Dost, (Baily Wilcox), Jessica Marden, Shelby Marden, Alexis Whitford, Destiny Marden, Montana Marden, Tristan Marden, and Brecklyn Marden, eight great-grandchildren;. Robert Snyder III, Darran Dost, Deacon Snyder, Dakota Dost, Kaiden Snyder, Brailyn Snyder, Xander Foor, and Christian Henkel. Also surviving are two sisters; Carol Penfold of Greenland, MI and Marla Mae Herrington of Illinois; and her two beloved dogs, Chloe and Bella. In addition to her parents and husband, Gloria was predeceased by four brothers and one sister; Lester Wascher, Virgil Wascher, Larry Wascher, Gordon Wascher and Marilyn Yenior. Funeral Services will take place at 11 a.m. Thursday, October 25, 2018 from the Christ Lutheran Church in Reese. Rev. Dr. Ed Kloos will officiate with Committal Services to follow in the Blumfield Township Cemetery. Gloria’s family will receive friends at the Ware-Smith-Woolever Funeral Home, 9940 Saginaw Street in Reese on Wednesday from 3-7 p.m. and at the church on Thursday from 10 a.m. until the time of the service. Those planning an expression of sympathy are asked to consider the Marden family. To plant a tree in memory of Gloria A. Marden, please visit our Tribute Store. "Email Address" would like to share the life celebration of Gloria A. Marden. Click on the "link" to go to share a favorite memory or leave a condolence message for the family.